The Pharisees and Herodians were out to set a snare for Jesus; they wanted a way to charge and arrest him. In previous attempts, their plots could not stand in the light of God’s truth. With this latest trap, they tried to confront Jesus with another question with two seemingly wrong answers; “Is it lawful to pay taxes to Caesar?” If Jesus answered yes, they would have him on charges of idolatry, for the coin bore the image of the emperor. If he answered no, the Romans would have a charge of disobedience against him. With this question, their trap was set; all they needed to do was await Jesus’ answer. Once again, the attempt to use Jesus’ words against him backfires. The Pharisees’ question suggests there are things that belong to this world and things that belong to God. On the surface, Jesus’ answer seems to validate such a position. “Render to Caesar the things that are Caesar’s, and to God the things that are God’s.” (Mark 12:17) But it isn’t long before the Pharisees and Herodians understand they are caught in their own trap. If they are to respond to Jesus, they must explain their reason for paying the tax all along. The church today often falls into this same trap. Bring this text up within a meeting or Bible study and almost immediately people will say everything belongs to God, even our money. They, of course would be correct. But it would not be long before the discussion falls into the realm of a two kingdom theory; some things belong to the world, some things to God. Others make statements concerning the church must be run like a business, or we need to be careful not to spend so much of our money. Of course, these are faulty beliefs; the trap is sprung and we are snared. The power of money is deceptive and deadly. Money buys material goods, material goods provide personal comfort, personal comfort leads us to a false notion that we are in control of our lives. The more goods we have, the more we feel we need. Luxuries become necessities; extravagance becomes essential. Even worse, the more we have, the more we feel we deserve, when in truth, because of our sin the only thing we deserve is death. Thankfully, the power of God’s love is stronger. 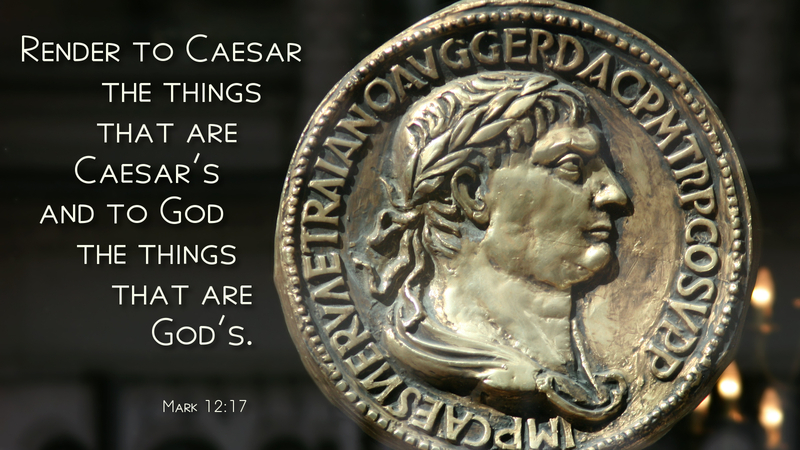 Jesus says, “Render to Caesar the things that are Caesar’s, and to God the things that are God’s.” All we have, even our very lives belong to God. Yet our Father provides all we need for life. As we render taxes and other payments, we do so understanding the authority and responsibility of the institutions also come from God. O Lord, our provider, we thank you for your many gifts, especially the gift of your grace through Jesus Christ our Lord. Amen. This entry was posted in Gospel According to Mark and tagged Authority, Authority of Jesus, Christian, Church, Gospel, Jesus Christ, Money, religion, Taxes. Bookmark the permalink.